Several years ago, Malcolm Dragon is beckoned to safety by his mother as the Special Operations Strikeforce deal with an invasion of the surface world by the subterranean race called the Demonoids. These monsters cause devastation before a giant crushes Rapture to death and would have killed Malcolm too had Mighty Man not pulled him to safety. He is dropped off back at the team’s headquarters where Stephenson comforts Malcolm. The child is assured that his mother had not really died but was in fact a double. A second Rapture steps forward and comforts her son before taking him to bed. Malcolm lays awake at night and hears his supposed mother talking with Damien DarkLord in the hallway. He learns that both this woman and the one who died were both replacements from parallel realities and that the real Rapture died years ago. 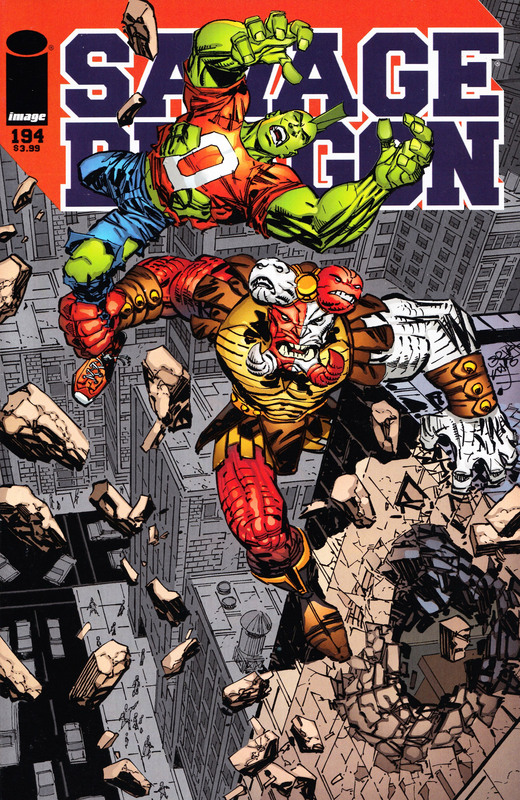 Back in the present and Malcolm Dragon is currently in battle with a rampaging super-freak called Torment. This villain has dual controlling personalities represented by different faces growing out the sides of his head. The evil voice directs Torment into causing as much destruction as possible and he is able to hold his own against Malcolm. As the hero is sent flying across the city, the good voice reasserts control and forces Torment into hiding, causing Malcolm to lose his foe. Malcolm heads over to the police precinct where he updates Captain Stewart on the situation. The vanishing of Torment disturbs Captain Stewart as they have no idea how long it will take for them to get another opportunity to take him down. He then instructs Malcolm not to stop by the precinct as it would reveal the nature of their relationship. It would not do well for people to discover that he is calling in a minor to do his dirty work. Their story is that Malcolm merely listens in to the police band radio rather than gets actual requests to help from the police. A shower is interrupted when LaMarr arrives at Malcolm’s apartment, having recently tracked down his apartment. He has brought three girls along with him whom Malcolm is told are all willing to sleep with him right now if he wants. Malcolm is furious at this intrusion and points out that he is in love with someone already. He reluctantly agrees to demonstrate his powers for them but they cannot stay there long as he is still on-call should Torment return. Malcolm then receives a telephone call that informs him that Torment has indeed been spotted and is close to his apartment. It appears that he must have followed him home after their last battle and is planning for some revenge. Malcolm heads outside and again asks that his unwanted guests leave for their own safety. Unfortunately it is too late though as Torment has arrived and he throws an entire building at the group. Malcolm smashes his way through the rubble and is horrified to discover that LaMarr and the girls have all been crushed to death. He leaps into action against Torment and a brutal clash then takes place. After a prolonged duel, Malcolm emerges victorious and stands over the defeated villain. The evil voice informs him that he will keep returning until he has killed everyone that is important to Malcolm and there is nothing he can do to stop him. Malcolm refutes that claim and simply bends down, grabs Torment’s head and uses his electrical powers to execute him. Barbaric laments the cancellation of his children’s television show Barney’s Fun Time Playhouse, angry that the network canned them after so many years of good ratings. Ricochet points out that their ratings have been awful for a while now, having plummeted soon after their friendlier image was lost by them losing weight during Mister Glum’s enslavement of humanity. The couple wonder where their next pay check is going to come from and how they will provide for their kids. An explosion is heard downtown and Ricochet leaps off to investigate, bouncing off of random buildings, people and other objects. She arrives at a museum where a heavily-armed and psychotic super-freak called KillCrazy is opening fire. 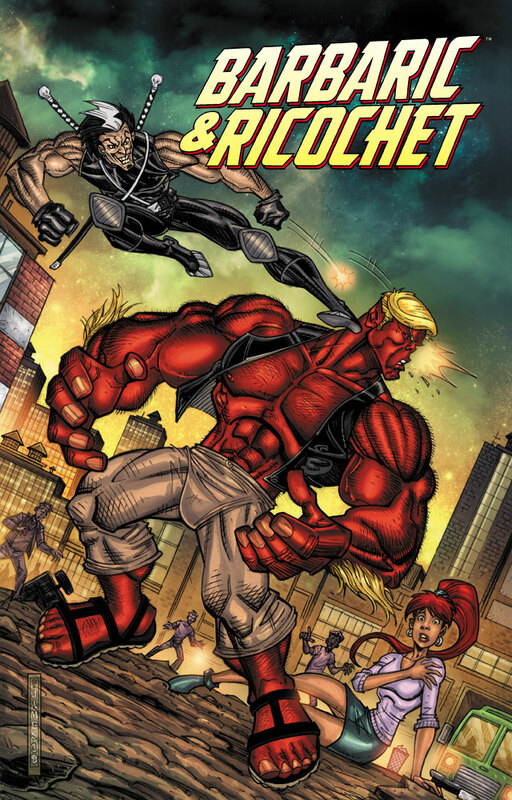 Ricochet witnesses the murder of an innocent woman before moving to tackle the villain. KillCrazy grows irritated when his gunfire all misses the agile heroine. He is then punched unconscious with a single punch from Barbaric who has only just caught up with him wife. In the aftermath, Captain Stewart thanks the two heroes for tackling KillCrazy. He notes that since Chicago’s heroes have almost entirely left the city that they have been struggling to deal with threats such as that. Barbaric is annoyed that the date night that he had planned with Ricochet has been ruined. Captain Stewart soon cheers him up though by handing over reward money from the museum which can provide them with an expensive night out. Ricochet points out that it would be smarter to use that money to pay for rent and bills and they will have to have a quiet night together. Barbaric notes that as they have proven themselves still capable of fighting crime then perhaps they should seek out membership in the new Special Operations Strikeforce.